2017 Lowe Roughneck 1860DT Theres no need to compromise, thanks to the Roughneck 1860 DT. This rugged Lowe jon boat earned its nickname, the in-betweener, because it offers all the maneuverability of a tiller model with the extended deck of a side console. The cavernous open floor offers room for everything you need. Add an 18-gallon aerated livewell, durable pressed-in cross ribs and a winged rear bench seat, and you have yourself one terrific boat, all for an incredible value. Count on Lowe to keep you in the action. Please note: This boat model may or may not be in-stock. A Nationally Advertised Price, if listed, may change without notice or include accessories not fully described herein. Please contact your local, authorized dealer for exact details on model availability and package pricing. 2016 Lowe Roughneck 1860DT There’s no need to compromise, thanks to the Roughneck 1860 DT. This rugged Lowe jon boat earned its nickname, “the in-betweener,” because it offers all the maneuverability of a tiller model with the extended deck of a side console. The cavernous open floor offers room for everything you need. 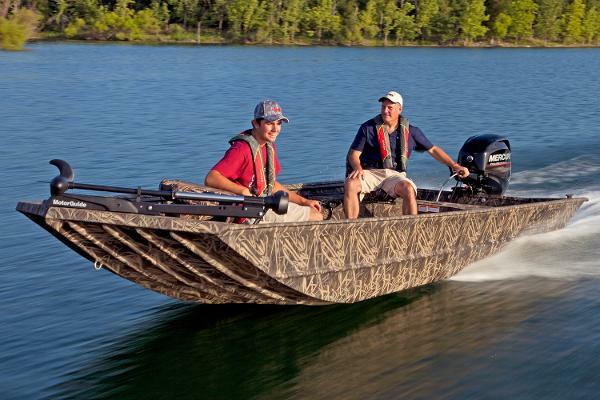 Add an 18-gallon aerated livewell, durable pressed-in cross ribs and a winged rear bench seat, and you have yourself one terrific boat, all for an incredible value. Count on Lowe to keep you in the action. Please note: This boat model may or may not be in-stock. A Nationally Advertised Price, if listed, may change without notice or include accessories not fully described herein. Please contact your local, authorized dealer for exact details on model availability and package pricing. 2016 Lowe Roughneck 1860DT There’s no need to compromise, thanks to the Roughneck 1860 DT. This rugged Lowe jon boat earned its nickname, “the in-betweener,” because it offers all the maneuverability of a tiller model with the extended deck of a side console. The cavernous open floor offers room for everything you need. Add an 18-gallon aerated livewell, durable pressed-in cross ribs and a winged rear bench seat, and you have yourself one terrific boat, all for an incredible value. Count on Lowe to keep you in the action.